MP711 Double Coated Adhesive Tape with a thickness of 0.09 mm, consisting of flexible adhesive It is a clear acrylic adhesive. The property adheres well to a variety of surfaces. Suitable for MP 711 is designed to be used as a laminate for industrial materials such as metal, plastic, paper, rubber, textile, plywood. Thermal Pad 9420 0.2 mm thick thermal conductive tape with the thermal conductivity of the tape ranging from 0.4 to 0.8 suitable for bonding 2 metals that bring heat together, such as LED, LCD-TV, Heat Sink, IC, MOS and CPU, electronic chip and heatsink, electronic heat pipe This type of adhesive tape has glue on both sides, so it can be attached to materials that are aluminum and high surface plastic materials as well. Polyamide tape Is a double-sided adhesive tape made from polyimide and silicone coating with heat-resistant properties. Suitable for insulating to prevent heat No residue after the tape is removed. 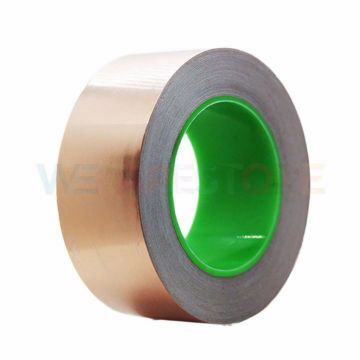 Fiberglass cloth tape, Teflon coating, thickness of 0.18 mm tape that can withstand heat from 75 C - 260 C, resistant to chemicals, smooth and slippery surface, electrical insulation, moisture resistance, water resistance Long life Easy to clean Do not leave adhesive stains on the skin when peeling off. Polyester tape Which is suitable for concealing in high temperature applications up to 120 degrees and adheres to the silicone coating surface well The tape has a silicone adhesive that acts as a mask and removes dirt from the surface.